Wilderness Festival 2019 will take place on Thursday 1st August to Sunday 4th August 2019. Important: As you approach the estate, you’ll see yellow AA road signs. Follow them, not your satnav. They will guide you into the festival, so keep your eyes peeled. Arrival information packs will be emailed out approximately 2 weeks before the festival. Please make sure you go to the appropriate gate for your campsite. RED GATE – General, Quiet, Meadow, Live-In Vehicle Camping and Car Parks. BLUE GATE – Family Camping Car Parks. GREEN GATE - Boutique Camping and Car Parks. Local Tickets can be exchanged at Red, Blue or Green Box Office. Arriving by train is very easy and a more environmentally friendly choice, so please consider it. Charlbury Station is the local station, and regular trains are available from London Paddington. There will be shuttle buses running to and from the station to various campsite bus stops at the festival - more information on these will be available nearer to the festival. You can also walk from the station, it is approximately 1.5miles, taking roughly 20minutes, but please be aware that the roads are winding in the country side. We will be partnering with National Express again to offer coach travel to Wilderness. Forget the hassle of driving, enjoy convenient and comfortable coach travel right to the festival gates. You'll get picked up from London Victoria Coach station from 10am on 1 August and return from 10am on 5 August, no fuss needed! All from the low price of just £43. Not only is it the easiest option, but it's also the most environmentally friendly. You can help cut down the weekend's emissions by Booking your Coach Travel to Wilderness 2019 now. Better yet, why not upgrade and travel in style with the VIP experience. Benefits include: fully air conditioned, reclining leather seats with sideways extend, deep tint windows with full draw curtains, DVD player, TV including Sky Sports Channels, Apple TV, power points at all tables, free 4G Wi-Fi, kitchen with fridge, microwave and oven, complimentary hot drinks facility and a water bottle. If you are coming to Wilderness by bike, hurrah! You're doing amazing work to help reduce the festival's carbon footprint. Red Fox Cycling are back to offer a Ride to Wilderness scheme. Get involved and find full information over on the Red Fox website. For General, Meadow, Boutique, Quiet and Live-In Vehicle Camping use this postcode for your satnav: OX7 3DG. If you're staying in Family Camping use postcode OX7 3HL. IMPORTANT: As you approach the estate, you’ll see yellow AA road signs. Follow them, not your satnav, They will guide you into the festival, so keep your eyes peeled! Or buy on the gate, but please bring cash. If you have booked Live-In Vehicle Camping Tickets and a Live-In Vehicle Pass then head for Red Gate. Vehicles cannot be dropped off before campsites open at noon Thursday 1st August. Vehicles will be directed to a pitch as they arrive, so if you would like to stay next to someone else, it is best to arrive together. 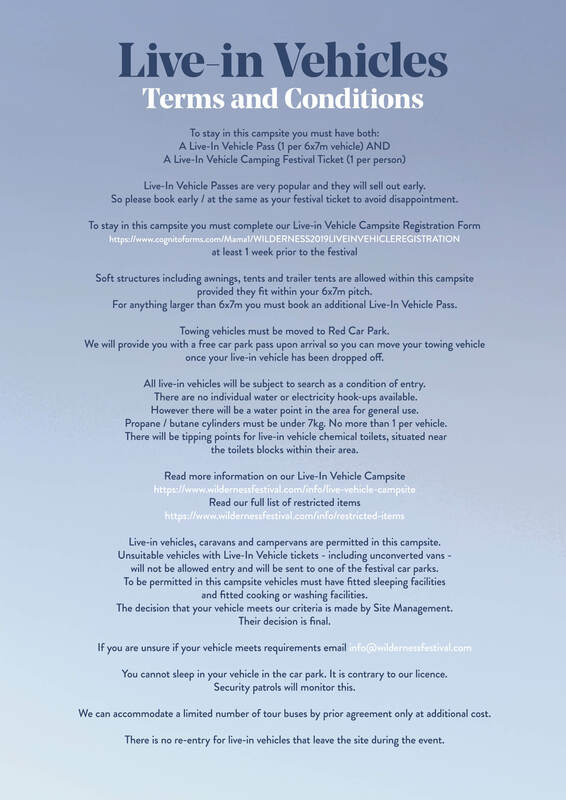 PLEASE NOTE: If you have not booked a Live In Vehicle Pass (1 per 6x7m pitch), you will not be allowed to enter the Live In Vehicle Campsite, and you are not allowed to sleep in your vehicle in the car parks. Full Live-In Vehicle T's&C's can be found here. Taxis from Charlbury station should cost no more than around £10 – £15, which you can share with fellow travellers you meet on the train. A taxi from Oxford Parkway is approximately £30. Unfortunately, the local Charlbury taxi services do not have disabled access but can store a folded up wheelchair in the back of their vehicles. You can arrive by foot at any of our gates. More information including customer information arrival packs and a 2019 entrance map will be available nearer to the festival. Continuing to make your life easier, Mr Trolley is back to help carry everything you need to the campsite. Hire points will be located in General, Family, Quiet and Boutique Camping car parks. How it works: Complete a hire form, pay your £50 deposit, a trolley is provided with bungees and safe use is explained. When the trolley is returned, the price is calculated based on duration of hire, deducted from the deposit and the remainder is returned. 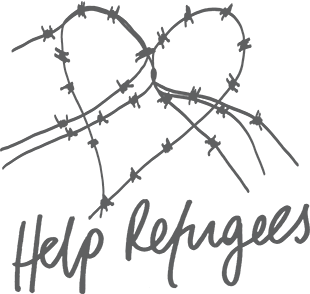 Hire is £5 per 30 mins (minimum hire). Overnight Hire: From Friday 6pm, you can hire a trolley overnight to wheel little ones around in or upgrade to a wagon conversion, a trolley with cushions and a canopy and sides that go up and down. There are a limited number of trolleys and wagons available to pre-book from the 1st March and a £2 fee applies. They will be ready for collection from Friday 6pm and must be returned by Monday 9am. Every 30 mins after 9am £5 will be deducted from your deposit. You can pre-book from 1st March until Monday 29th July, or until stocks last.